of two stamped 4.0-mm-thick sheetmetal stampings brazed together in a secondary operation. 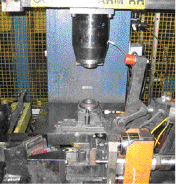 This costly production method required excess mass to meet Federal Motor Vehicle Safety Standard (FMVSS) requirements. Engineering manager Larry Johnson of ITW CIP, a producer of metal stampings for the automotive industry, simplified the product by designing a single-piece door striker from common sheet stock, which eliminated secondary operations yet exceeded FMVSS requirements with a 30 percent reduction in part weight. Developing this product required a nontraditional approach that allowed ITW CIP to produce varying shapes not previously attainable. Furthermore, the technology has helped customers reduce related field issues such as door-chucking noises and vibration. Created by the Worcester Pressed Steel Co., Worcester, MA, and sponsored by The Quarterly Club, the Design Award recognizes a manufacturing company for outstanding achievement in developing an innovative product design. As part of its award, ITW CIP California received a $1500 cash prize. Okay Industries, Inc., New Britain, CT, received the Ulbrich Award for Competitive Excellence in Product Development for developing a subassembly for an endoscopy device used in minimally invasive surgeries. The company worked with its customer, a major medical-device manufacturer, to jointly develop the low-cost endoscopy assembly—an articulating tube controlled by guide wires during surgery. and subassemblies for the medical, automotive, defense/aerospace and other specialty industrial markets, partnered with its customer to develop the sophisticated component, typically manufactured as a laser-cut and welded tube assembly, as a significantly lower-cost stamping while maintaining critical features. Following the joint development effort and prototyping by Okay, the patent-pending manufacturing process was adopted. Here, individual links are stamped and interconnected as a complete set to maintain their locations during weld assembly. After all of the interconnected flat links have been joined via laser-welded springs, the links are separated and the assembled articulation joint is formed into its finished diameter. To reconnect the open ends of each link, a laser operation seam-welds the last row of internal springs across each link from end to end. Using metal stampings to produce links in place of laser-cut tubing has provided tremendous cost savings for the customer. Additionally, the ability to weld most of the springs in place while the links are in the flat state simplified tooling/welding-fixture design and reduced the project’s capital cost. With the automated laser-welding operation and integration of the automated rollforming operation, the customer is ensured that every part will meet print specifications without requiring secondary operations. Sponsored by Ulbrich Stainless Steels and Special Metals, Inc., North Haven, CT, the Product Development Award acknowledges a manufacturing company that demonstrates outstanding innovation in developing and manufacturing a product that best uses metal in place of a nonmetal competitive material. Along with the award, Okay received a $1500 cash prize, which the company has elected to contribute to the Central Connecticut State University School of Technology. For taking over complete parts production from a customer and compressing the entire value chain from several weeks to literally hours, E.J. Ajax & Sons, Inc., Fridley, MN, netted the SKD Automotive Group Productivity Award. The customer, Radius Track, a maker of metal tracks that allow for curved drywall surfaces, initially produced parts inhouse to control quality and protect the proprietary portions of its manufacturing process. Once the company established market demand for the tracks, it contracted with E.J. Ajax, which produces medium- to long-run progressive-die metal stampings, to design tooling and perform stamping operations on the track. E.J. Ajax then would ship the product back to the customer for bending, crimping, packaging and shipping. This process required three to four employees at Radius Track and six operators on six machines at E.J. Ajax, with production from start to finish—including shipment of parts back and forth—taking one month. Through continuous productivity improvement, E.J. Ajax defined methods to perform crimping, then to produce the entire part and also package and ship directly from its plant. The E.J. Ajax team tasked with improving the manufacturing process for Radius Track sought to develop a continuous-flow operation that would fit in a designated 60-ft.-wide bay. 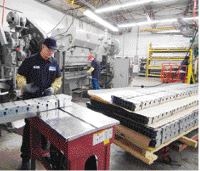 To limit capital expenditure, Ajax personnel retrofitted two used stamping presses, a coil arbor, feeder, straightener and press brake with new controls and sensors for on-demand inline production. The continuous-flow cell includes feeding, straightening, blanking, 90-deg. forming, crimping, packaging and labeling. The team worked through a total productive maintenance plan for the process, including all machinery and tooling, and determined correct positioning of sensors and operators. Uptime of this continuous-flow cell exceeds 99.8 percent. Process innovation enabled E.J. Ajax to take over the entire operation from Radius Track while reducing its own production personnel responsible for the work from six to three. A material-handling improvement suggested by one of the E.J. Ajax production-line operators brought the total number of workers required to two. Sponsored by SKD Automotive Group, Brampton, Ontario, Canada, the Productivity Award recognizes outstanding achievement by a PMA manufacturing member in the development and implementation of programs, processes and use of assets that lead to significant improvements in productivity. Along with the award, E.J. Ajax received a $1500 cash prize, which it donated to Hennepin Technical College Foundation. SKD Automotive Group-Brampton Division, Ontario, Canada, received the Signature Technologies Process Control Award for employing air sensing to ensure proper fastening of two parts via interference fitting, often referred to as press fitting. SKD supplies metal stampings and modular assembly components to the automotive industry. 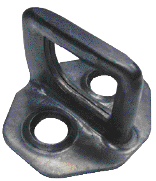 Press fitting, a friction-fastening process, applies high pressing force to two parts—one with a slightly different shape than the other across its mating surface. As the parts press together, high friction occurs at areas along the mating surface where the parts “interfere” with each other’s space, in effect fastening the parts. Therefore, proper fastening relies on individual parts that possess the correct shape and orientation, resulting in high friction when pressed together. To ensure correct part shape and orientation, SKD employs air-pressure sensing. The sensing takes place in one of the company’s control-arm assembly cells, and enables 100-percent assurance that a ball joint is not misaligned with an extruded hole prior to press fitting. With SKD’s setup, circuitry involves regulated incoming air, an airflow switch sensor and I/O control. The airflow sensor detects sufficient air backpressure. As the push-in tooling makes contact with the ball-joint race enclosure, if the ball joint is not properly aligned with the extruded hole, tooling will not seat properly on the enclosure. As a result, air will leak through, the airflow switch will sense no/low backpressure and the press cylinder will not be pressurized to push the ball joint into the hole. The PLC will fault, alerting the operator of a misaligned ball joint. 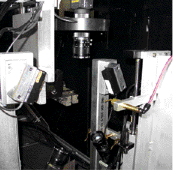 Overall quality has increased due to this process-control method. Prior to air-pressure sensing, all assemblies had to be 100-percent inspected by an operator for proper insertion depths and any visual damage. These inspections, determined to be only 85 percent effective, resulted in the customer receiving nonconforming assemblies. SKD officials report that since implementing air-pressure sensing, customer complaints regarding insertion depth and retention loads have disappeared. The Process Control Award, sponsored by Signature Technologies, Oak Point, TX, promotes the application of electronic-analog closed-loop process controls in the metalforming process by recognizing innovative electronic solutions implemented by a North American manufacturing company, which have resulted in significant quality, cost reduction and/ or productivity improvements. In addition to the award, SKD Automotive Group received a $1500 cash prize. Okay Industries Inc., New Britain, CT, received the Parkview Metal Products Excellence in Quality Award for its commitment to quality as evidenced through quality practices and results. The company, which produces precision metal stampings and subassemblies for medical, surgical, automotive, defense, aerospace and other specialty industrial markets, lists its priorities as safety first, quality second and productivity third. The result is a strong quality culture, according to company officials. Okay’s management team has developed the company’s Prioritized Action Plan for Continuous Improvement (PAPFCI), which is reviewed and approved by the company’s outside board of directors. This document clearly defines specific objectives by part number or process and identifies champions responsible for action items. Each quarter, senior staff meets with all managers to review PAPFCI progress. In addition, senior staff meets with department managers weekly to review issues including customer complaints, efficiencies and delivery performance. Okay’s president holds a monthly communications meeting as well, reviewing key items with all employees, including monthly quality and delivery performance analysis. Okay uses an enterprise-management system to help manage data so that empowered employees can make informed decisions to control the company’s products and processes. The system also tracks problem controls, broken down into customer complaints, internal audit nonconformances, supplier corrective actions, machine and equipment failure, audit findings, and continual improvements. The corrective-action system automatically sends e-mail reminders to those required to perform each action item. Problem solving is a team effort at Okay, with 30 employees trained in several problem-solving techniques. Numerous items enhance Okay’s preventive-action processes, including the creation of a Process Ready Check Sheet, ensuring that each operation is ready to begin production and requiring a sign off by the manufacturing and quality departments. Okay also works closely with its suppliers, performing several onsite supplier audits in 2007. Upon recognizing a supplier problem, Okay issues a supplier corrective-action request (SCAR). In 2006, when Okay began the program, the company issued 144 supplier corrective actions. In 2007 the SCAR count had declined by 51 percent. Okay also had three of its key suppliers attend extensive root-cause analysis and problem-solving classes, and the drop in supplier-related issues reveals the success of the partnership. Okay also participates in second- and third-party assessments. The company was visited by and/or audited by eight customers in 2007, and received successful audits from all. In addition, Okay undergoes biannual ISO/TS assessments. A team of 12 internal auditors perform audits throughout the year, touching on each process and the requirements of TS 16949 and ISO 9000:2000. The Quality Award, sponsored by Parkview Metal Products, Lake Zurich, IL, recognizes outstanding achievement by a PMA manufacturing member in the development and implementation of a company-wide quality system that effectively uses continuous improvement. Along with recognition in industry publications and at exhibitions, Okay received a $1500 cash prize, which it has pledged to donate to E.C. Goodwin Technical High School in New Britain, CT.
E&E Manufacturing Co., Inc., Plymouth, MI, received the Pitcher Insurance Agency Safety Award due to its efforts in making safety an integral part of the company’s business plan. Employing more than 300 workers, the company manufactures heavy-gauge stampings, weld nuts, deep-drawn extruded stampings, tapping plates, serrated shims and automotive seating-component assemblies. At E&E, all safety and health issues are dealt with proactively, with associates actively involved in the company’s safety programs. In addition, all associates are eligible for incentives in achieving company expectations toward safety performance. The company also has developed and maintained a strong working relationship with the Michigan Occupational Safety and Health Administration (MiOSHA) to help achieve its safety goals. In November 2003, E&E became the first automotive stamping company in the nation to receive OSHA’s Star Award, following a rigorous inspection and evaluation process with MiOSHA’s Michigan Voluntary Protection Program onsite teams. In 2007 the company was recertified through MiOSHA to maintain its Star Award status. E&E reportedly remains the only automotive metal stamper in the country to have achieved this status. E&E assesses its safety and health program annually, designing all processes to eliminate potential worksite and ergonomic risks prior to shop-floor implementation. It spent more than $200,000 in 2007 on safety improvements, including implementation of a new product line that included an assembly process addressing guarding issues as well as numerous ergonomic challenges. A cart rotates to the operator and stands at a height of 34 in. to present itself to the operator in an ergonomically effective fashion. In addition, slides prevent the operator from reaching through rack sections. The company also designed and implemented a downdraft smoke-collection unit for its welding department, and designed self-contained ventilation units that have become an industry standard. E&E also recently implemented a Kevlar-sleeve program to protect workers from lacerations, which led to a 65 percent reduction in forearm lacerations among E&E press operators. The company’s program has yielded impressive results, as reportable injuries have continued to decline over the last nine years and are well below industry averages. E&E has set a goal of zero lost-time injuries for 2008 and a 4.0 recordable injury rate. The Safety Award, sponsored by Pitcher Insurance Agency, Chicago, IL, acknowledges either an effective comprehensive safety program or a specific innovative idea in the context of an effective safety program. Along with the award, E&E Manufacturing received a $1500 cash prize. A prestigious PMA award in design, safety, productivity, product development, quality, process control or education is more than a pat on the back. Distinguish your organization from the competition, recognize employees for a job well done and be promoted at the METALFORM tradeshow, on the PMA website, in news releases, at PMA’s Annual Meeting and in the pages of MetalForming magazine. Penn United Technologies, Inc., Saxonburg, PA, received the A.R. Hedberg Training and Education Award. The company’s $1.2 million Learning Institute for the Growth of High Technology (LIGHT) training center is used to train Penn United’s more than 650 employees through apprenticeships and National Institute for Metalworking Skills (NIMS) credentialing. The facility also will be used to train the company’s on-the-job-training trainers, senior trainers and coordinators in on-the-job training techniques. LIGHT, formed in 1999, includes $700,000 worth of state-of-the-art machinery, three classrooms and five laboratories (grinding, machining, computer numeric control, chemistry and computer). Through LIGHT, in 2004-2005 the company registered its first competency-based apprenticeship program (machinist). In 2006, the institute graduated the nation’s first NIMS-certified machinist. Also that year, a LIGHT apprentice earned first place in the regional and national NTMA CNC apprentice competitions. In 2007, Penn United graduated the nation’s first NIMS-certified stamping journeyman and hosted the regional and national NTMA apprentice competitions. To date, 212 students have graduated from LIGHT, earning a total of 300 NIMS credentials. The institute offers several programs, including one-year certificate programs for carbide finish grinders, carbide preformers and plating technicians. In addition, state-approved apprenticeship programs are offered for tool and die makers (five years), precision grinders (four years), precision machinists (four years), press technicians (two years) and quality assurance technicians (two years). LIGHT offers 37 courses, with each class normally conducted for 3 hr. Penn United spends approximately $45,000/ month on such training and tracks it as an operating expense. The company also provides registration and testing fees for nationally recognized credentials and certificates. New hires for machining and grinding positions attend basic training for six weeks, 8 hr./day, to receive initial skills training before being matched to a production position. They are paid their hourly wages while attending this training. In addition to providing training to Penn United employees, LIGHT has begun expanding its reach. A committee comprised of local manufacturers is being formed to transform LIGHT into a regional nonprofit training center open to all manufacturers. See also: Ajax Metal Forming Solutions, LLC, E&E Manufacturing Co., Inc., Penn United Technologies, Inc.